What is Edraw Mind Map? Edraw Mind Map is an OS-agnostic mind mapping solution that helps users create, share, save, or print indiscriminate mind maps. It’s a highly productive tool that comes with a suite of templates and examples for simplifying brainstorm diagram, creating mind maps, project timeline, SWOT analysis, life planner, and sketch maps. The platform can visualize ideas and quickly organize and arrange tasks to benefits all users. Edraw Mind Map delivers endless possibilities to help users monitor any data or information with ease. The software works seamlessly on Windows, Mac OS, and Linux devices, and it’s a standout thanks to its great variety of text, graphics, and diagramming tools; a suite of organizational applications; and an intuitive user interface. Some of its main features include professional Gantt view, built-in resources, automatic layout styles, advanced presentation modes, and smart mind mapping guide. Edraw Mind Map is an easy-to-use mind mapping tool that presents a flat learning curve to all include the technophobic. It has an intuitive interface that takes a familiar feel and look to that of the Microsoft Office applications. The interface makes it easy to access basic features and allows you to use the software with the Microsoft Office solutions. With this program, changing the mind map layout type, theme, and connection style; adding clip arts or local images to customize your mind maps is a breeze. One of its core benefits is derived from the easy-to-use tool used to create effective mind maps. This tool allows you to create clear and organized mind maps which can be used to categorize and present ideas in a manner that’s easy to understand. In addition, the mind map maker features a neatly organized ribbon toolbar, rich built-in symbols, and auto connection function to simplify and streamline the design process. The designing is further simplified by the generic graphics formats and a WYSIWYG printing used to enhance the productivity in mapping. Besides, the Smart connector and tools make it easy to draw diagrams on one software simultaneously and preview with ease. Additionally, Edraw Mind Map offers comprehensive support for brainstorming, project management, knowledge management, and note-taking. It provides a suite of nine preset styles and numerous clip arts to enhance the quality of your presentation mind map. The platform integrates seamlessly with Microsoft applications and supports attachments, hyperlinks, and notes. Better still, Edraw Mind Map allows you to collaborate and share mind maps with ease. It takes a single click to share your visuals into Excel, PowerPoint, Word, PDF, or HTML. Also, its streamlined print preview exhibits the diagram page breaks and features impressive zoom capabilities. 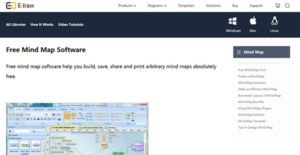 If you are interested in Edraw Mind Map it might also be beneficial to examine other subcategories of Best Mind Mapping Software collected in our database of SaaS software reviews. Organizations have diverse wants and requirements and no software application can be ideal in such a condition. It is pointless to try to find an ideal out-of-the-box software product that meets all your business needs. The smart thing to do would be to customize the system for your unique requirements, worker skill levels, finances, and other aspects. For these reasons, do not hurry and pay for well-publicized trendy solutions. Though these may be widely used, they may not be the ideal fit for your specific wants. Do your research, check out each short-listed platform in detail, read a few Edraw Mind Map reviews, contact the maker for clarifications, and finally select the application that presents what you want. How Much Does Edraw Mind Map Cost? We realize that when you make a decision to buy Mind Mapping Software it’s important not only to see how experts evaluate it in their reviews, but also to find out if the real people and companies that buy it are actually satisfied with the product. That’s why we’ve created our behavior-based Customer Satisfaction Algorithm™ that gathers customer reviews, comments and Edraw Mind Map reviews across a wide range of social media sites. The data is then presented in an easy to digest form showing how many people had positive and negative experience with Edraw Mind Map. With that information at hand you should be equipped to make an informed buying decision that you won’t regret. What are Edraw Mind Map pricing details? What integrations are available for Edraw Mind Map? If you need more information about Edraw Mind Map or you simply have a question let us know what you need and we’ll forward your request directly to the vendor.